We will meet in the Minnetrista Cultural Center lobby then we will go to a reserved conference room. We need a chef for the demo this saturday! Please contact James if interested! In two weeks we will have our monthly meeting, and this one will be very important! We will be submitting our points to the ACF so they can record them. I encourage everyone to attend this time! Dont forget we have a chef demo and a meeting tomorrow at the Minnestrista!!! Bring your friends too, so they can enjoy the market and the presentation! Come an hour early on saturday and enjoy a ice carving at 9! 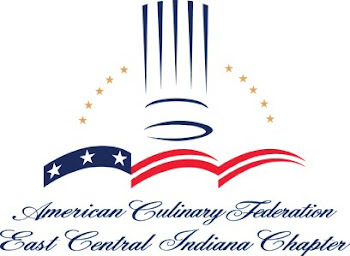 The ACF East Central Indiana chapter is a group of chefs and food enthusiasts that get together to learn and explore 'all things culinary'. We focus on educational and humanitarian activities that affect our local community.